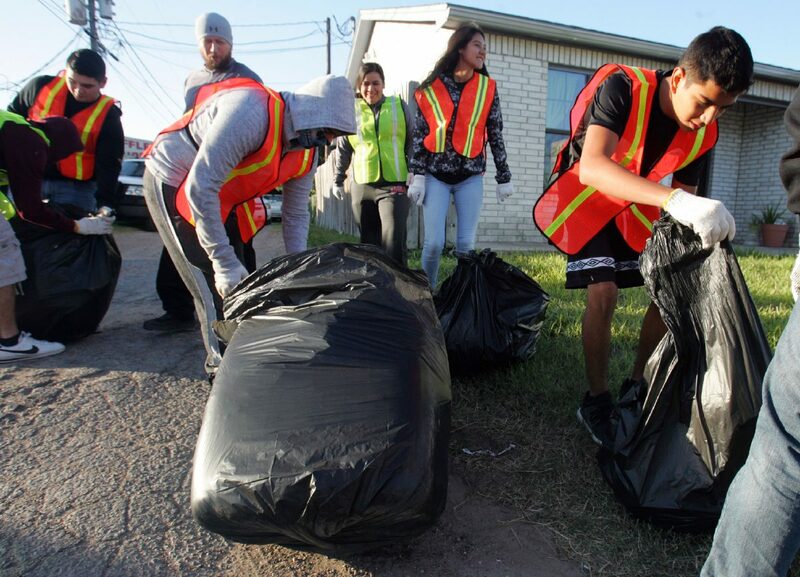 Students from Weslaco High School fill trash bags with debris picked up near Pike Boulevard during a cleaning of streets and alleyways Saturday, October 28, 2017, in Weslaco. 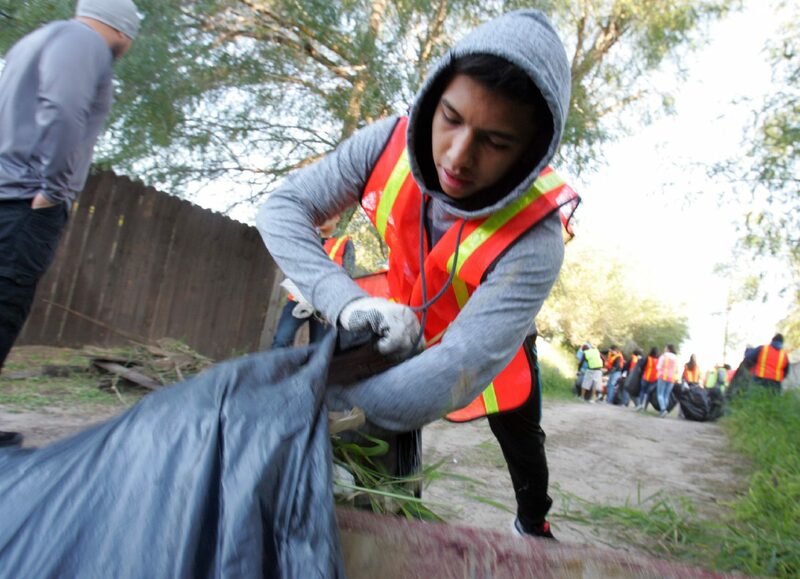 WESLACO — Despite the cold temperatures Saturday morning, city leaders and volunteers got an early rise and made their way to Mayor Pablo G. Peña City Park for Clean Sweep 2017, an effort to beautify the city. Weslaco officials began this project by dividing the city into four sections. The project began last October with 100 volunteers covering one section of the city at a time. They repeated the process in April of this year with another 100 volunteers assisting the city in maintaining cleanliness. The project grew to nearly 200 individuals participating Saturday. 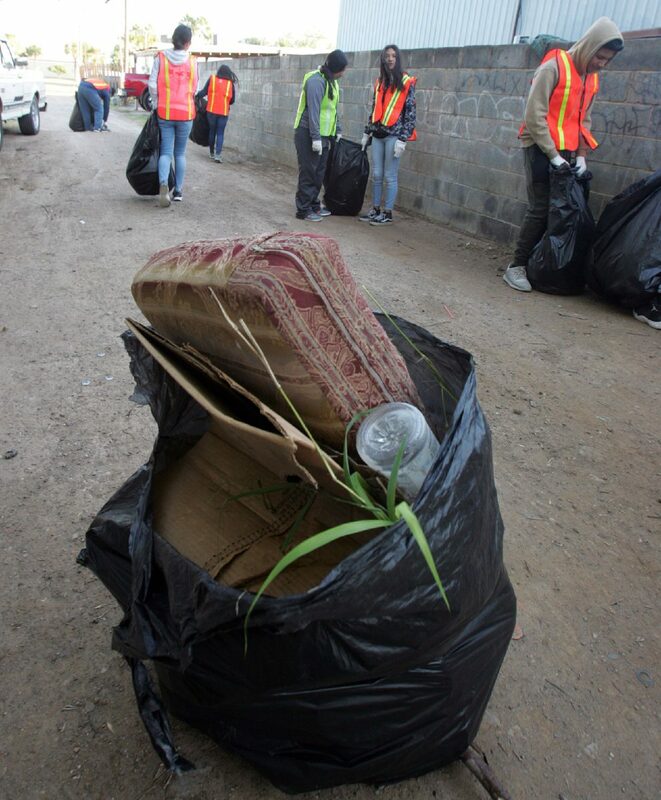 Saturday’s cleanup covered the west side of Airport Drive to the east side of Illinois Avenue between Pike Boulevard and Business Highway 83. The volunteers arrived early at the city park, with temperatures in the 50s, and were bused to targeted neighborhoods to begin the cleanup. Volunteers cleared both streets and alleyways. A trash bag is filled with debris picked up in an alley near Pike Boulevard during Clean Sweep 2017 on Saturday, October 28, 2017, in Weslaco. David Rico places trash cleared from an alleyway into a bag for pickup during Clean Sweep 2017 on Saturday, October 28, 2017, in Weslaco. 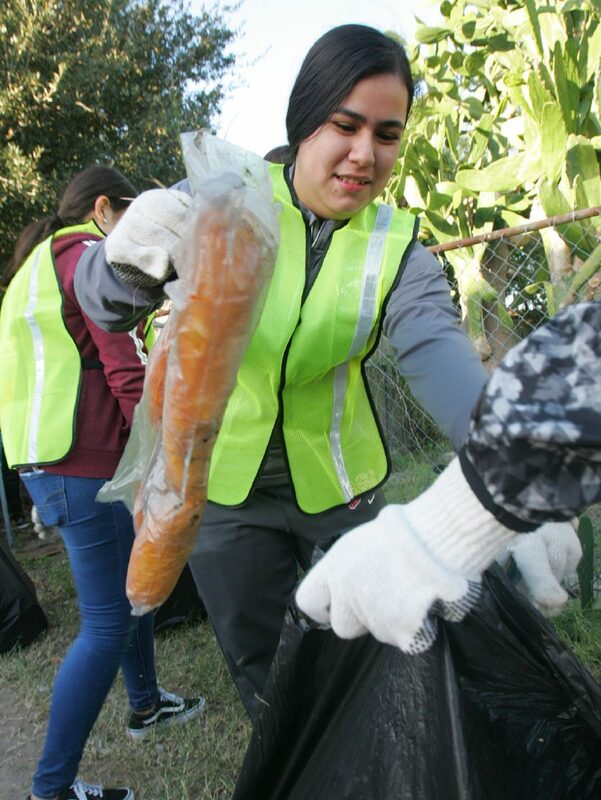 Nallela Najera picks up a loaf of discarded bread and places in into a trash bag during Clean Sweep 2017 on Saturday, October 28, 2017, in Weslaco. David Rico collects trash during a cleaning of streets and alleyways on Saturday, October 28, 2017, in Weslaco. Joe Pedraza, health department official for the city of Weslaco, said the project is a community outreach beautification effort for the city. 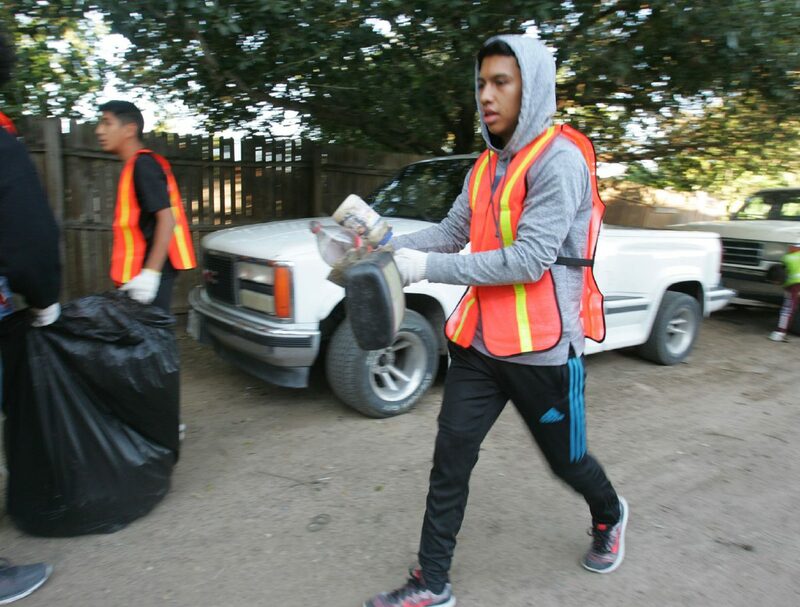 “The kids go through alleys and the streets to pick-up trash and debris,” Pedraza said. The volunteers were enlisted from Weslaco High School, Weslaco East High School, IDEA Academy, individuals completing community service, a group from Home Depot, psychology clubs, sociology clubs and B. Garza Middle School. Rebekah de la Fuente, senior planner for the planning and zoning department, helped organize the project with Pedraza. Once the volunteers finished their duties, they placed the trash and debris on the side of the road for Republic Services waste company to collect the items. Jackie Salas, Weslaco East High School senior and Sheepdogs Criminal Justice club member, said this was her first time participating in this type of event. “I think it was really fun and really cool to help out the community and its fun because we’re all bonding as a group and helping each other out,” Salas said. Another Weslaco East student, Stacey Martinez, a junior and member of the National Honor Society, said she liked helping out and making her community cleaner.